Shelton, CT, October 22, 2018 – Centrix Dental welcomes Dean Westin, a new Regional Account Manager (RAM) to our field sales team. Dean will support both valued dental office customers and the Centrix network of preferred dealer partners on the West Coast. Shelton, CT, May 2018 – Centrix Dental announces a new Regional Account Manager will be joining our field sales team, Zachary Palmer. Zach will be focused on sales to valued dental office customers and preferred dealer partners in the Northwest region of the U.S.
Shelton, CT, May 2018 – Centrix Dental names a new Regional Account Manager in field sales, Nicholas Campbell. Nick will support our extensive network of dental office customers and Centrix preferred dealers in the Southeast. Shelton, CT, May 2018 – Centrix Dental welcomes Andrew Kirlin, a new Regional Account Manager (RAM), to our field sales team. Andrew will support both valued dental office customers and the Centrix network of preferred dealer partners in the Mid-Atlantic US. Shelton, CT, March 2018 – Centrix, Inc. is pleased to announce John Eaton is joining the Centrix team as Director, North American Field Sales. John brings to Centrix a wealth of dental sales and leadership experience and a track record of driving steady multimillion dollar sales growth in the US and Canada. Shelton, CT, June 26, 2017 – Centrix held its annual International Sales conference this past weekend with participants joining in from nearly a dozen countries around the world. This three-day meeting, in addition to recognizing outstanding sales performances, had two primary educational focuses: Prevention For Life and Easier, Faster, Better Impressioning. Shelton, CT, June, 2017 – This week, Dental Product Shopper and Readex Research recognized Centrix, Inc. for 2017 Advertising Excellence based on our NoCord™ VPS advertising that appears in the prestigious DPS trade publication. Specifically, the award recognizes our NoCord, No Kidding! campaign for overall Advertising Effectiveness that achieves "the highest attention-getting, believable and informative scores" in the research conducted by Readex on behalf of Dental Product Shopper. Shelton, CT, May 2017 – Centrix, Inc. made a donation to this weekend's Dentistry from the Heart (DFTH) event led by Dr. Robert A. McCulla, DDS at his Turlock Dental practice in Turlock, California. This is Dr. McCulla's 5th year hosting the event that is part of a worldwide nonprofit organization dedicated to providing free dental care to those in need. This year, Dr. McCulla was joined by 2 other dentists, 4 hygienists and 3 oral surgeons for a day dedicated to providing free cleanings, extractions and fillings. Centrix Couture Products Receives Best Product Awards by an Independent Dental Research Organization! Shelton, CT, March 2017 – Centrix, Inc. is proud to announce that Couture™ Diamond Polishing Paste and Couture™ GripStrip™ have both received "Best Product" awards for 2017 by a well-known independent dental research organization. Shelton, CT, February 1, 2017 – Centrix Dental is participating in the annual America's ToothFairy Smile Drive leading up to National Children's Dental Health Month in February. Designed to raise awareness of the importance of oral health and collect oral care products for at-risk children, Smile Drive contributions collected at Centrix headquarters in Shelton, CT will be donated to our local Boys & Girls Clubs. Shelton, CT, December 15, 2016 – Our revolutionary, one-step impressioning system, Centrix NoCord™ VPS, received rave reviews in the November 2016 issue of AGD Impact. Reviewer Dr. Howard S. Glazer, DDS, FAGD calls NoCord VPS a "yes" product for any practice because this easy-to-use system accurately captures all the margin details without the need for retraction cords or pastes. Dr. Glazer praises our "secret" formula that controls bleeding and retracts gingiva in one simple cord-free step. Shelton, CT, June, 2016 – Centrix, Inc., a leading innovator of dental materials, preventive products and applicators and delivery systems, today introduces NoCord™ VPS, the first one-step, self-retracting impressioning system that retracts gingiva, controls bleeding and delivers an accurate, final impression all in one system! Centrix FluoroDose®, the Best Fluoride Varnish, announces new Caramel Flavor! Shelton, CT, August 11, 2015 – FluoroDose is a 5% sodium fluoride cavity varnish that goes on smooth, not sticky, with no "wooly" feeling. Exclusive LolliPack® makes FluoroDose the easiest fluoride varnish to apply, while providing maximum fluoride uptake. It dries when in contact with saliva; no need to maintain a "dry field" or "moisture control". 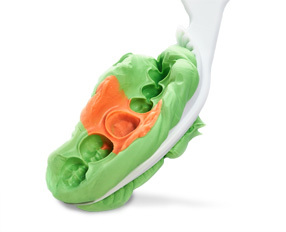 Shelton, CT, June 8, 2015 – Centrix offers a new proximal separator to help make finishing and polishing easier for dentists. Unique design. Diamond-coating. Autoclavable. Shelton, CT, June 4, 2015 – Centrix offers a new addition to the GripStrip product line to help make finishing and polishing easier for dentists. Unique design. Diamond-coating. Finish and polish with only one strip.